On April 24, a French delegation from the Minister of Agriculture and the Minister of Environment took part to a meeting with Italian authorities, stakeholders and researchers in the city of Racale (Apulia region) to discuss the latest information on Xylella fastidiosa and raise awareness on the measures to take in order to hamper the spread of the bacterium in Europe. The meeting was organized by Coop. ACLI Racale with the coordinators of H2020 projects POnTE and XF-ACTORS. A French ministerial delegation composed by representatives of the Conseil général de l’alimentation, de l’agriculture et des espaces ruraux (CGAAER) and the Conseil général de l’Environnement et du Développement Durable (CGEDD) participated to a meeting with Italian researchers, stakeholders and policymakers to discuss various issues related to the spread of Xylella fastidiosa in Apulia region (southern Italy). 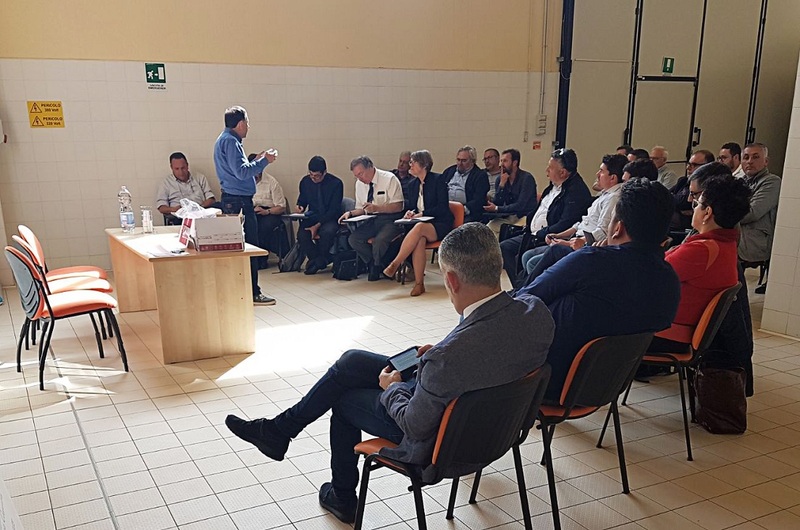 The meeting took place on April 24 in Racale (Lecce), located in the “demarcated infected area” where the bacterium of Xylella is causing serious damages to olive trees and, consequently, to the olive oil production, but also to nursery industry. The main goal of the meeting was to exchange information and best practices on the various topics related to Xylella. In particular, the French delegation was interested to learn about the actions put in place to control this harmful pathogen, and the main consequences related to their implementation. To this aim, the meeting involving a wide number of local stakeholders with direct experience in the field proved to be very useful. – It is crucial to identify an institutional body that is legitimised to organize and host debates participated by all the actors involved on the various problems caused by Xylella, as it is Regional Government (Regione Puglia) for this specific case. – Given the large number of legislative provisions emended at regional and national levels, difficulties are encountered often in the implementation of the EU legislative measures; a consensus was expressed about the need to give priority to the phytosanitary measures in the case of emerging pathogen(s) likewise the spread of X. fastidiosa. Following the meeting, participants drafted a document (containing the above mentioned suggestions) to be delivered to the Regional Public Administration. This meeting is part of a consulting activity requested by the French Ministers of Agriculture and the Environment to lead an analytical and advisory mission on the control and prevention of Xylella fastidiosa, in order to learn the most effective ways to deal with the bacterium. This request followed the recent declaration of Corsica as “zone of containment”, thus a zone where the bacterium is considered endemic, and the increased concerns about the spread of Xylella in the PACA region. This meeting is part of a wide program, which aims to produce a report (by the end of June) with recommendations to the French authorities concerning the implementation of the containment measures of Xylella fastidiosa to be implemented in Corsica. The meeting was organized by Donato Boscia (IPSP-CNR and POnTE coordinator), Maria Saponari (IPSP-CNR and XF-ACTORS coordinator and Federico Manni of Coop. ACLI Racale, with the participation of representatives of the Conseil général de l’alimentation, de l’agriculture et des espaces ruraux (CGAAER) and the Conseil général de l’Environnement et du Développement Durable (CGEDD) for the French delegation and a large number of Italian policymakers and organizations: Donato Metallo – Sindaco di Racale, Giulio Palumbo – Assessore all’agricoltura di Racale, Servizio Fitosanitario Regione Puglia, IAM-Bari, Coldiretti Puglia, ANVE, CIVI-Italia, Confagricoltura Lecce, APROL Lecce, CIA Lecce, Ordine Dottori Agronomi e Forestali di Taranto e Lecce, Consorzio tutela DOP Terra d’Otranto, Consorzio Vivaisti Viticoli Pugliesi, Lega Cooperative. The meeting was attended by several members belonging to XF-ACTORS and POnTE projects Consortia and related Stakeholders’ boards.